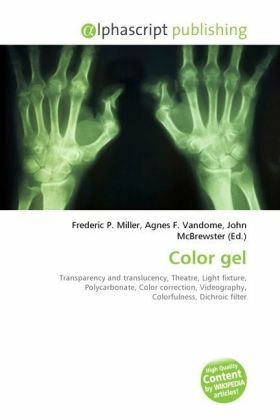 A color gel or color filter, or a lighting gel or simply gel, is a transparent colored material that is used in theatre, event production, photography, videography and cinematography to color light and for color correction.Modern gels are thin sheets of polycarbonate or polyester, placed in front of a lighting fixture in the path of the beam.Gels have a limited life, especially in saturated colors. The color will fade or even melt, depending upon the energy absorption of the color, and the sheet will have to be replaced. In permanent installations and some theatrical uses, colored glass filters or dichroic filters are being used. The main drawbacks are additional expense and a more limited selection.In Shakesperean theatre, red wine was used in a glass container as a light filter. In later days, colored water or silk was used to filter light in the theater. Later, a gelatin base became the material of choice. Gelatin gel was available at least until 1975. The name gel has continued to be used to the present day.